Malevolent forces conspire to ravage the lands and cities of Faerun, and only the most valiant heroes can thwart their dark designs. If you are a player, this book helps you play heroic champions with the might and conviction to destroy the worst evils of the world. 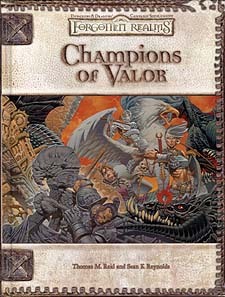 If you're a Dungeon Master this book contains everything you need to create worthy challenges and rewards for your valorous heroes as they struggle to save the Realms from the darkness that threatens it.